I have always thought that I was a safe worker, being careful to avoid injury. I am sure that all of you think the same thing about your own work. However, what happened to me last Saturday morning was a real wake-up call, and I want to share it with you. If it can prevent just one injury to one of you, it will be worth the embarrassment of confessing this. I was using a high-speed cut off disk to grind off a tack weld I was unhappy with. As best I can figure, the thin disk got caught in the cut. Perhaps I had changed the angle of the tool. Perhaps the gods decided that it was time to teach me a lesson. It happened so fast that I have no memory of it. The grinder was suddenly whipped from where I was cutting and sliced into the index finger of my left hand, right through my glove as if it wasn't even there. All I knew was that there was suddenly lots of blood and pain. After a quick wash and first aid, it was off to Urgent Care. The magic words "He's bleeding" bypassed the waiting room and got me immediate attention. They quickly determined that they didn't need to forward me to the emergency room, which was strangely comforting. After some x-rays (to make sure I hadn't hit the bone -- I had just missed it), they cleaned the grit from the wound and stitched me up (5 stitches). It still took almost two hours from the time I got there. The doctor turned out to know about Lemons, and is a Baja Bug off-roader. He shared some of his close calls in the garage, and we agreed that a moment's inattention can change your life. I had cut some nerves, so I now have no feeling on the side of my index finger. They say it is unlikely that they will grow back, but it is possible. Fortunately, I still have feeling on the side facing my thumb, which is important for grasping. I'm really pissed off that I let this happen. For one thing, I must keep it immobilized for two weeks, which prevents me from getting the Super Snipe ready for Infineon. Fortunately Spank has offered me the use of his Austin America as a backup plan. Thank you, Spank! For another, it tells me that I wasn't paying attention to what might happen. Please, please do not let this happen to you. I am very lucky that I didn't lose my finger entirely. Stay alert to everything that might possibly go wrong, and change how you are working if there is any way your body parts might be in the way. I'll not trying to make light of your incident, but I've had worse from a breadknife; to the bone on two fingers because I didn't think it was sharp enough to cut through the hardroll in my hand in one gentle swipe... doctor was not pleased that I used papertowels and electrical tape, but it was considerably safer than making an attempt to get to the hopsicle, all things considered. It happens quick people. don't chop your fingers off. 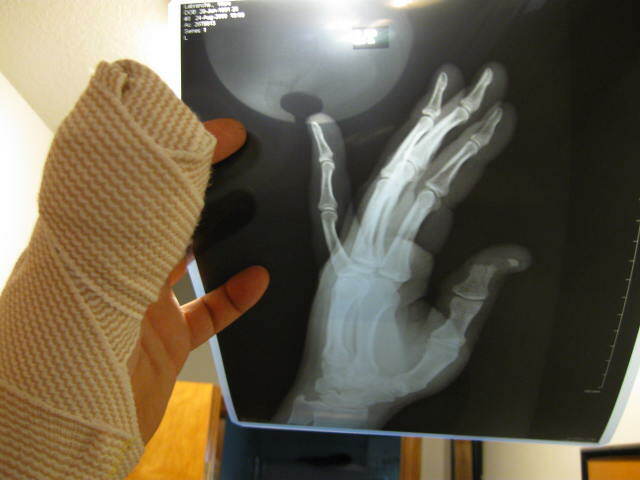 glad you still have your finger. That super snipe has bad juju! Two weeks out still got 3 weeks to get car going.! I cut my finger real bad and crazy glue wouldn't hold it. Got 3 stitches urgent car on a holiday in and out 45 minutes. I asked Dr if he could put more stitches cause 3 sounded wimpy. Anyway i didnt take it easy and took stitches out myself 5 days later. But in 20 years of eorking on cars never went to urgent care til then, it was due! Ive seen more injuries from cut off wheels than any other tool. Angle grinders can hurt, and hurt quickly. 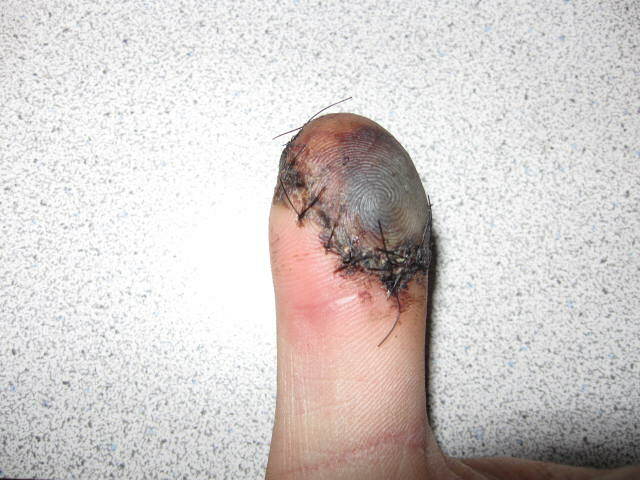 Here's my Lemons related angle grinder injury story, also as a warning. Just as we are leaving to go to NJMP last year, we were late, and I couldn't find the keys to the tongue lock on my trailer, so out comes the angle grinder with the cutoff wheel. Just when I was most of the way through, something bound up and shot the grinder out of my hands toward the ground, right into my left foot. Damn, that hurt, and the grinder was bouncing all over the place still on. I unplugged it, turned it off, and then hooked it up again and kept cutting. As I kept working and loading up, a few minutes later my foot still really hurt, so I decided to pull it out of my shoe to look, my sock was completely crimson, soaked through. Dammit. I hopped back into the house and up the steps, and put my foot in the sink to wash it off, much to my girlfriend's horror. After some time with pressure on it, then put on some wound closure strips and covered with gauze, elevated it for about 5 minutes, and then I had to get back on my feet to keep loading the car to leave. All race weekend I was changing the dressing on it twice a day, hobbling around, which was even harder as I was both racing and judging, so on my feet a lot. It took about two weeks for it to heal up enough that it wasn't actively a problem, and there is still a very prominant scar on my foot. Watch out for those angle grinders, they bite. I use the air cutoff wheel a bunch in my work. Haven't had to go to the ER yet. But there have been some close calls, that I know would not have been such a problem if the wheel was turning the opposite direction. Lo and behold, this reversible cutoff tool was listed in a sale flyer recently. Who knew somebody had developed a cheap, reversible cutoff tool? Now that I know, there will be one of these on my cart soon. Cheaper than a trip to the ER. i'll make sure my team sees this, and perhaps we'll put a little more consideration into the beer/tool coefficient more carefully. Thank you. Glad you're ok, that Snipe is really making you work for it! Hopefully, you'll be healed up and ready to get greasy soon! I had a learning moment a month ago. I was using an X-Acto knife to cut some model parts. The knife cut through suddenly, went through my leather thumb guard, and sank through my thumbprint until the blade hit my fingernail - missed the bone by about a millimeter or two. It's disturbing to watch the backside of a knife blade disappear into your thumb. I pinched the wound closed, grabbed a Kleenex and wrapped it up, and lifted my hand over my head for about ten minutes while my wife wrapped up what she was doing and herded kids from their pajamas back into real clothes. Before we headed out the door I went into the bathroom, took the kleenex off, and looked at it. The wound was clean and it had stopped leaking for the moment. I took the opportunity to apply a bead of super glue along the cut. It sealed and was durable, so I called off the emergency room visit. The next day I went to see my doctor. He said I did a good job and there wasn't anything more he needed to do. "Come back immediately if it starts to turn colors or if you see dark streaks going up your arm." Air Force Self-Aid and Buddy Care classes did their job and it only cost me a $25 copay compared to $300 for my share of an emergency room visit. 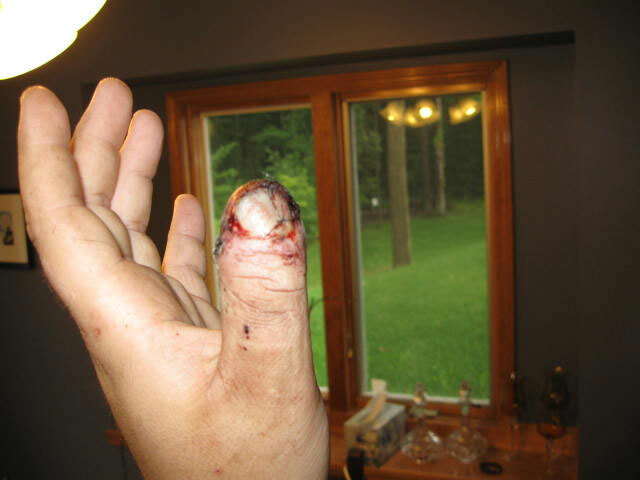 my thumb got crushed in the shop. the only saving grace was there was a tiny flap of skin holding the separated bit off so i did not have to find it to bring it to the hospital. it took about 2 years for the feeling to come back properly. for a while i had feeling, but it felt like i was touching a different spot than i was. today there's just a tiny spot that does not have feeling and you can see that the fingerprint is rotated about 10degrees, they just didn't attach it at quite the right spot. apparently nerves grow back at an inch of nerve per month, but it's not a strait shot. it's a squigly line and if you're lucky it goes in the right general direction. Get a nail, hold it in vice grips. Heat the nail up until it is rocket hot. Apply nail to the thumb nail. Pierce the nail at the site with the most pressure. It won't hurt, trust me. Do this now or you'll lose your thumb nail forever. Press. Expect icky old blood to come out of the hole you just made. And this is not medical advice, and you're not my patient. I'm the doctor who is a wife. Which makes the grease hard to explain to my patients... www.tetanusneon.com. If you see her w/ a bris and a blowtorch, - Run! As we get more familiar with our crap-heaps sometimes it is all too easy to take safety for granted. I'll be sure to remind all our teammates that this car is still trying to kill them. I am not giving legal advice, and you are not my client. Mary's telling you to go someplace and get that taken care of by medical professionals trained in such procedures. She suggests you do it ASAP. Like now. And she may retract her suggestion, which is given solely on the basis of something she learned once, somewhere. Maybe. If I didn't know Erik quite well at this point, I'd say this was an oxymoron. But I can totally see this going down like this. Glad to hear you're okay. My lunch suddenly feels like it was two sizes too big. yeah, what he said. Seek a professional, you know what they say about advice on the Intarwebz. Wait a sec, I just gave Internet advice to be careful about Internet advice... this may cause a feedback loop. 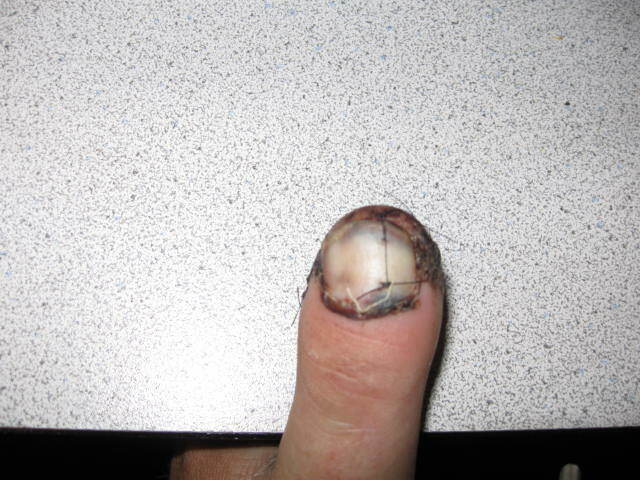 I appreciate that you are a doctor, and I have done that in the past with a small drill, but this swelling is not in the area just under the nail. Its okay though, the swelling is going down now. How is the finger doing? Those sutures look sorta snug and the skin is a bit blanched. Of course that could be caused by using Lido with epi to numb the area but ummm... no fingers nose, toes or hose with epi I don't think. As for heating a nail to pop a hole in a nail... yeowch. I would never advise someone to do that sort of thing to themselves but I may know where there is a bovie cautery to use for such things in a pinch. Not that I ever would. When I was a kid, my mother smashed her thumb in the car door (Plymouth Volare! ), and I remember my dad doing this. It's simple and effective self-treatment. You're just trying to melt a small hole in your thumbnail for the pressure to relieve through, not boring all the way through your thumb. There are no nerve endings in your nail, so it doesn't even hurt. That said, it sounds like Parkwod's just fine. To be honest, the only reason I went and saw my doctor after I split my thumb is because my wife wouldn't let me rest until I had a professional approve of my work. She swore up and down the doc was going to chew me out for superglueing it shut. ...She swore up and down the doc was going to chew me out for superglueing it shut. The photo was taken 48 hours after, when I was having it examined by my regular doctor. 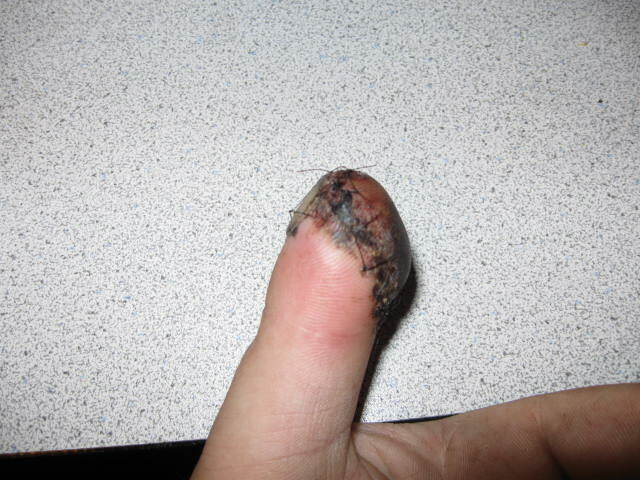 The finger is doing OK, four days after the incident, with no significant pain or swelling. I never even bothered to fill the prescription for Vicodin that I got at Urgent Care. My doctor has me taking antibiotics (Cephalexin) just in case the wound didn't get entirely cleaned out. I'm supposed to change the dressings every 48 hours, and get the stitches taken out next Thursday (12 days after the incident). I'm damned lucky! My typing speed is a fraction of normal, and I can't work on the car, so the frustration level is high, but I'm just thankful that I still have a finger. Please, guys, use my injury as an opportunity to examine the way you work, and take the time to do it safely.